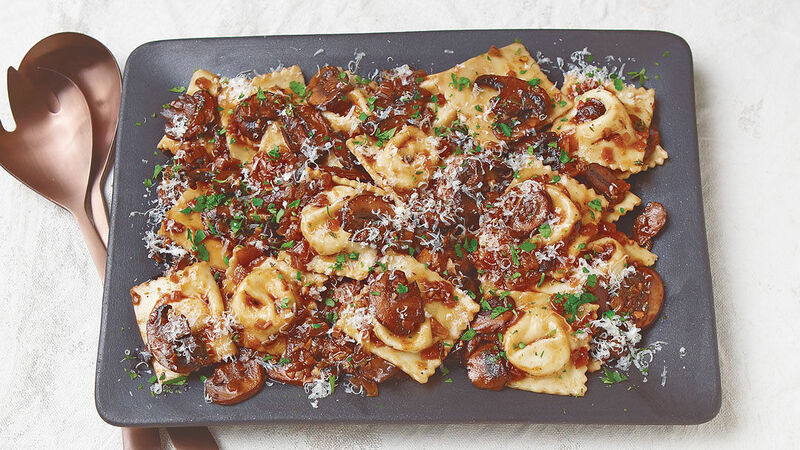 Though delicious made with cremini mushrooms alone, this one-pan sauce is even more spectacular if you use a mix of mushrooms. Heat 1-1/2 Tbs. of the oil in a large skillet over medium-high heat. Add the mushrooms, 1/4 tsp. salt, and a few grinds of black pepper. Stir to combine, then spread the mushrooms out in the pan and cook, undisturbed, until well browned on one side, about 3 minutes. Stir and continue to cook until well browned all over and any liquid has evaporated, about 3 minutes. (if the mushrooms are dry and the pan begins to scorch, add a drizzle of oil.) Transfer the mushrooms to a plate. Add 1 Tbs. of the remaining oil in the same pan over medium heat. Add the onion and cook until translucent, about 2 minutes. Add the garlic and cook until fragrant, about 30 seconds. Add the tomato paste and cook, stirring, for 1 minute. Return the mushrooms and any liquid to the pan. Add the flour, thyme, and pepper flakes, and cook, stirring frequently, for 1 to 2 minutes. Add the wine, and stir until thickened. Add the broth, and simmer until the liquid reduces to a light sauce. Season to taste with salt and pepper. Meanwhile, cook the pasta in the boiling water according to package directions until al dente, drain, and add to the skillet with the mushrooms. Stir to coat over low heat. Serve topped with the parsley and cheese. Yummy! Yummy! Yummy! I have made it with raviolis and also used it as a topper for bread toasted and spread with mascarpone cheese. Addictive! Made this for my Bunco group. Huge success!! My husband also loves it. Will definitely make again. This is fantastic! You can take this technique and use a side dish or, drool, stuffing omelets!